Got an afternoon (or a weekend) to kill? How about 70 bucks or so? Then do like we did… be spontaneous, pack some snacks, maybe some camping gear, and rent a JEEP! 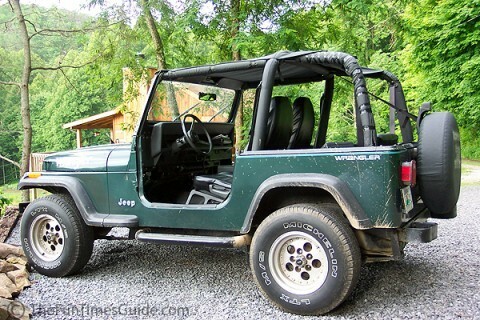 Who knew that you could rent fun vehicles like Jeep Wranglers in just about every state?! 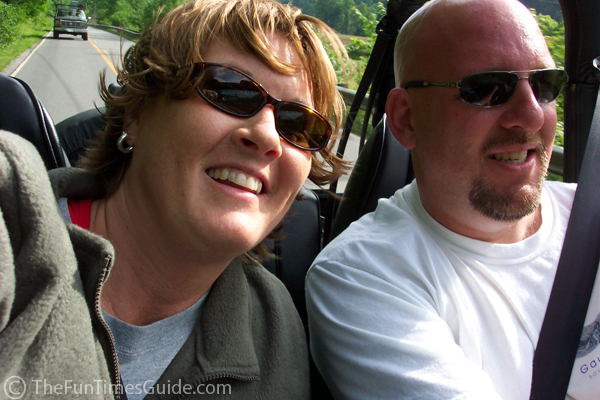 The first time we rented a Jeep Wrangler was from Lee’s Jeep & Scooter Rentals in Gatlinburg, Tennessee. This was a year ago, and to this day, it’s still one of our funnest memories together. This is the way we chose to “test drive” a Jeep Wrangler before we actually bought one. We knew that a Jeep Wrangler fit our lifestyle and that SOME day we’d probably be getting one, but this test drive would either seal the deal or have us thinking twice. Turned out, just weeks after we rented this ’94 Jeep Wrangler (and put nearly 500 miles on it two days! ), we bought our own 1990 Jeep Wrangler YJ. In fact, we discovered that we like Jeeps so much that we bought our second Wrangler, a 2004 Jeep Unlimited TJ a year later! There’s no better way to run a Wrangler through its paces (both off-road and on) — with no obligation — than to rent one. Of course, it started pouring rain about 15 minutes after we rented the Jeep! Just our luck, Lynnette & Jim are in Gatlinburg?… Mother Nature gets the signal to drop a load from above! We were told there was “a bikini top” in the back of the Jeep in case it rained, only we didn’t know how to put it on. Therefore, Lesson #1: Always know your options when it comes to rain, and test out those options beforehand! Here’s what the inside of our rain-soaked Jeep looked like after we got drenched from head to toe (and roof to floor! ), thanks to 20 solid minutes of pouring rain with NO roof — other than a wimpy tree that we tried to gain some shelter under. Next, we decided to learn how to put the bikini top on. Here’s Jim attaching the bikini top to the Jeep. It’s a cinch once you get the hang of it. Then, we decided to try to get lost out on the backcountry mountain roads around Gatlinburg. Toward the end of the day, we had found a deserted old “Jeep Road”. At this point, we had gone about 7 miles down this narrow, twisty 28-mile 4WD road between North Carolina and Tennessee (poking along at about 10 mph while dodging rocks, stumps, and mud holes!) when we found this. It had taken us nearly 2 hours to go 7 miles, so we were not looking forward to backtracking this route! 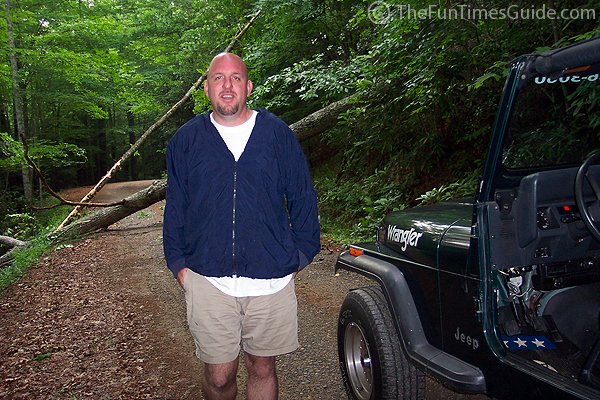 Jim thought about going OVER it… or UNDER it… or even MOVING it — after all, this was a 4WD Jeep — but it was no dice. …Sometime around MIDNIGHT, we eventually made it back to our cabin! That night and the next morning, here’s where you could find us: in the Jacuzzi! More about the cabin we rented in Gatlinburg. Here’s another Gatlinburg vacation we enjoyed — with links to ALL of our favorite places to ride: Roaring Fork Motor Nature Trail, Foothills Parkway, Rich Mountain Road, Cades Cove, Newfound Gap Road, Parson’s Branch Road, Balsam Mountain and Heintooga-Round Bottom Road and more! A bit of a drive, but worth it: Tail of the Dragon and the nearby Cherohala Highway. Now go ahead, and rent your own Jeep Wrangler!